It’s time to revisit the attic. No, not that dusty, dark space where you keep your old knick-knacks and hoarded throw-aways. I’m talking about the cramped room where four children were locked away because their mother wanted a bulky inheritance. 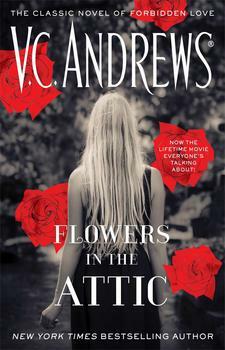 Yes, the attic from V.C Andrews’ twisted classic, Flowers in the Attic. 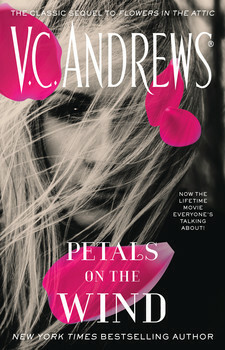 But now, in Petals on the Wind, it’s years later, and Cathy has finally returned to seek vengeance on her mother. A party is underway at Foxworth Hall, and Cathy wouldn’t miss it for the world. Just a little after ten o’clock I used the wooden key Chris had carved so many years ago to slip unseen through a back door into Foxworth Hall. Already many guests were there and more were still arriving. The orchestra was playing a Christmas carol and faintly it drifted up to me. Music so sweetly haunting I was taken back to my childhood. Only this time I was alone in alien territory with no one to back me up as I stole quietly up the back stairs, keeping to the shadows, ready to hide quickly if necessary. I wended my solitary way to the grand central rotunda to stand near the cabinet where Chris and I had hidden to look down on another Christmas party. I gazed downward to spy upon Bart Winslow standing beside his wife who was wearing bright red lamé. His strong voice was hearty as he greeted his arriving guests warmly, shaking hands, kissing cheeks, acting the genial host in true fashion. My mother seemed somehow secondary to him, hardly needed at all in this huge mansion that was soon to be hers. Smiling bitterly to myself, I stole on to my mother’s grand suite of rooms. It took me back in time! Oh, golly-golly! I used my little-girl exclamation of delight, of surprise, of dismay or frustration, though I had better and more accurate words at my disposal now. Tonight I had no frustrations, only a lilting sense of justification. Whatever happened, she had brought it upon herself. Look, I thought, there was the splendid swan bed, still there, with the little swan bed across the foot. I glanced around, seeing it was all the same, but for the brocade fabric on the walls—that was different. Now it was a soft plum color, and not strawberry pink. There was a brass valet to hold a man’s suit ready, and unwrinkled, until he put it on. That was new. I hurried on into my mother’s dressing room. On my knees, I pulled out a special bottom drawer to feel around for the tiny button that had to be pushed in a certain combination of numbers to trigger the complicated lock. And would you believe it—she still used her birthday numbers of month, day and year! My! She was a trusting soul. In no time at all I had the huge velvet tray on the floor before me, so I could help myself to the emeralds and diamonds she had worn to that Christmas party when first Chris and I beheld Bartholomew Winslow. How we’d loved her then, and how we’d resented him. We had been still in the shadow of our grief for our father, and hadn’t wanted Momma to marry again—not ever again. As in a dream I donned the emerald and diamond jewelry that went so well with my green velvet and chiffon gown. I glanced in the mirror to see if I looked as she had way back then. I was a few years younger, but yes, I did look like her. Not exactly, but almost—and enough to convince—for were two leaves from the same tree ever duplicates? I replaced the jewelry tray, put back the drawer, leaving everything as it had been. Except now I wore several hundred thousand dollars worth of gems I didn’t own. One more look at my watch. Ten-thirty. Too soon. At twelve I wanted to make my grand entrance, like Cinderella in reverse. With utmost caution, I crept stealthily along the long halls to the northern wing, and found that end room with the door locked. The wooden key still fitted. But my heart didn’t seem to fit my chest. It beat too fast, too fierce, too loud and my pulse raced too excitedly. I had to keep calm, self-possessed, do everything right and not be intimidated by this awesome house that had done its best to destroy us. When I stepped into that room with the two double beds, I stepped back into childhood. The gold-colored, quilted satin spreads were still on the beds, precisely made without a wrinkle. The ten-inch TV was still in the corner. The doll house with its porcelain people and antique made-to-scale furniture waited for Carrie’s hands to bring it to life again. The old rocker that Chris had brought down from the attic, still there. Why, it was as if in here time stood still and we’d never left! Even hell was still on the walls, gruesomely represented by three reproductions of masterpieces. Oh, God I hadn’t known this room would make me feel so—so shredded inside. I couldn’t afford to cry. That would make my mascara run. Yet I wanted to cry. All about me flitted the ghosts of Cory and Carrie, just five years old, laughing, crying, wanting outside, the sunlight, and all they could do was push tiny trucks to make-believe San Francisco or Los Angeles. There used to be train tracks that ran all over the room and under the furniture. Oh, where did the train tracks go—the coal cars, the engines? I pulled a tissue from my tiny evening bag and held it to the corner of one eye and then the other. I leaned to peer into the doll house. The porcelain maids were still cooking in the kitchen; the builder still stood near the front door to welcome the guests arriving in a coach pulled by two horses—and lo, when I looked in the nursery, the cradle was there! The missing cradle! For weeks we’d hunted to find it, fearful all the time the grandmother would notice it missing and punish Carrie—and there it was, just where it should be! But the baby wasn’t in it, nor were the parents in the front parlor. Mr. and Mrs. Parkins and baby Clara were now mine and never would they reside in this doll house again. Had the grandmother herself stolen the cradle, so she could then see it missing, and ask Carrie where it was, and when it couldn’t be produced, she’d have good reason to punish Carrie? And Cory as well, for he would automatically, without fear for himself, run to protect his twin sister. It was like her to do something mean and cruel like that. But if she had, why had she stayed her hand, and not played out her role to the end? I laughed bitterly to myself. She had played out her role to the end—not just a whipping, but something better, something worse. Poison. Arsenic on four sugared doughnuts. I jumped then. It seemed I heard a child laugh. My imagination, of course. And then, when I should have known better, I headed for the closet and the high and narrow door at the very back end and the steep and narrow dark stairs. A million times I’d ascended these stairs. A million times in the dark, without a candle, or a flashlight. Up into the dark, eerie, gigantic attic, and only when I was there did I feel around for the place where Chris and I had hidden our candles and matches. Still there. Time did stand still in this place. We’d had several candle holders, all of pewter with small handles to grasp. Holders we’d found in an old trunk along with boxes and boxes of short, stubby, clumsily made candles. We’d always presumed them to be homemade candles, for they had smelled so rank and old when they burned. My breath caught! Oh! It was the same! The paper flowers still dangled down, mobiles to sway in the drafts, and the giant flowers were still on the walls. Only all the colors had faded to indistinct gray—ghost flowers. The sparkling gem centers we’d glued on had loosened, and now only a few daisies had sequins, or gleaming stones, for centers. Carrie’s purple worm was there only now he too was a nothing color. Cory’s epileptic snail didn’t appear a bright, lopsided beach ball now, it was more a tepid, half-rotten squashy orange. The BEWARE signs Chris and I had painted in red were still on the walls, and the swings still dangled down from the attic rafters. Over near the record player was the barre Chris had fashioned, then nailed to the wall so I could practice my ballet positions. Even my outgrown costumes hung limply from nails, dozens of them with matching leotards and worn out pointe shoes, all faded and dusty, rotten smelling. As in an unhappy dream I was committed to, I drifted aimlessly toward the distant schoolroom, with the candelight flickering. Ghosts were unsettled, memories and specters followed me as things began to wake up, yawn and whisper. No, I told myself, it was only the floating panels of my long chiffon wings . . . that was all. The spotted rocking-horse loomed up, scary and threatening, and my hand rose to my throat as I held back a scream. The rusty red wagon seemed to move by unseen hands pushing it, so my eyes took flight to the blackboard where I’d printed my enigmatic farewell message to those who came in the future. How was I to know it would be me. Behind the small desk that had been Cory’s I scrunched down, and tried to fit my legs under. I wanted to put myself into a deep reverie that would call up Cory’s spirit that would tell me where he lay. As I sat there waiting, the wind outside began to blow, picking up strength so it howled and hurled the snow slantwise. Another blizzard was on, full force. With the storm came the drafts to blow out my candle! The darkness shrieked, and I had to run to get out! Run fast . . . run, run, run before I became one of them!